Gimli loves to lick us, but we thought we were going to drown the first time we met after being in Thailand! From left to right she is kissing Michael, Vivian, Michael's mom, and Michael's sister. We don't mind "puppy kisses" except when she gets near someone's mouth. 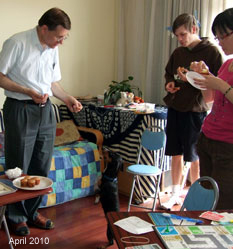 After our return from Thailand (Feb 2007), we gave Gimli more space to run in (inside the apartment). She already had access to the balcony and a play pen in the living room, to Andrew's room and the small hallway, and through a "run" had access to the kitchen. Now she could go to about a third of Michael's office (not just a box) and could play in the whole living room. Mind you, she was only allowed in any of these areas when someone was with her; otherwise she was in the laundry room. Of course, one of us is home most of the time, so she had lots of opportunities to move about. Up until the summer of '08, we used a doggy door (a panel she had trouble jumping over) to lock her in the laundry room whenever we left the house. Now (2010) we just block off Andrew's room and our bedroom and close the gate between the hall and the dining room. So, she can move a little more freely, in "her" room, the hall, or her part of Michael's office. 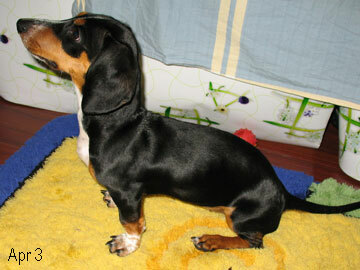 About a week after we got back (March 2007, about 21 weeks old), Gimli seemed to change again. Her energy level increased, and she didn't want to mind as well as she used to (especially outside). We also noticed her first baby tooth on the floor around this time, which might explain her desire to chew on hands and other soft things like damp washcloths. (We also found teeth in early April; there's no telling if she has swallowed others. As I recall, this stage only lasted about two weeks.) Though she needed more exercise, we were scared (remember the IV?) to take her outside much, since she loved to pick things up in her mouth and there is a lot of trash around our apartment complex. We tried to keep her in the middle of the street, but keeping her mouth empty (and not getting run over) required constant vigilance. Inside, we've taught her to run after bits of dog food (banana chips, Cheerios, etc), and she also loves to fetch her ball and other things. However, she didn't like to give them back without some tugging! Now, she releases the ball easily enough, but you do have to deal with lots of dog slobber on it. Still, the running does her good, and she loves to run. By April 2007, we were taking her outside again about once a day. When Andrew takes her (they both like to run), he uses a retractable leash that goes up to five meters, and she is in constant motion. Michael generally takes her on longer walks; in May he found a choker-chain (actually made of nylon), and using it for a while seemed to break her habit of pulling (constantly) on the leash. Andrew's runs give her exercise, and Michael's walks let her use her nose (an instinct that she loves to use). Now (2010), she doesn't pull as much and doesn't eat things while walking; she still likes the freedom of the retractable leash, and likes to use her nose. Another problem we faced upon our return from Thailand (2007) was a lot more puddles to clean up around her "Chinese toilet" potty. The main cause was that her body had gotten longer, so she now had to be in just the right spot or she would miss the toilet--and no one was around to consistently help her learn where "just the right spot" was. 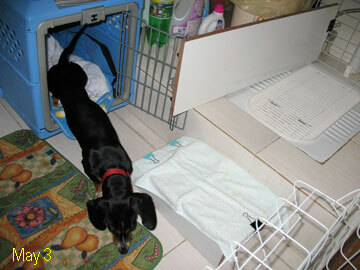 We tried several things, including trying to use a plastic tray to expand her potty area, but progress was slow. After several weeks (another round of crate training), she had figured it out again. We still use a plastic tray to make her potty area bigger, but if the area around the Chinese toilet drained into the toilet (like it is supposed to) this would not be necessary. 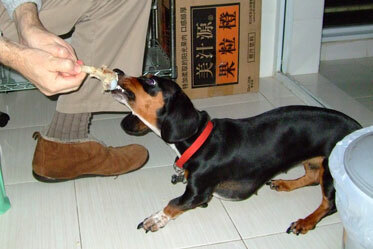 By the way, part of how we trained her to use the Chinese toilet was to give her a doggie cookie each time she used it. Even now (2010), she comes to us for a cookie after urinating or pooing on the toilet; this is great because each cookie reinforces the behavior, and it also lets us know that we need to go flush! For the first year or so, there were still occasions when she was so busy playing that she forgot to go to a potty and just wet the rug (or wherever she was) instead. From what we've read, this is a common problem with beagles. After the first year or so, it hasn't been a problem. However, she does something the books call "submissive urination"--I'll explain that below! 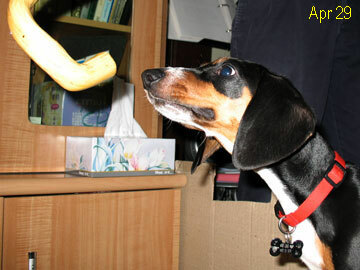 (Late March 2007) In spite of having many dog toys, her favorite playthings were often towels and washrags. If you can get it away from her, she loves to fetch a towel with a knot in it. Then she fights with the towel and slings it every which way (third photo). Knowing the value of getting her to run/fetch, Michael often struggled with her (when she was a puppy) to release something to throw, but that put his hands dangerously close to her sharp puppy teeth, and he ended up with lots of cuts and bandages to show for it! We were very thankful when she had lost her sharp puppy teeth! 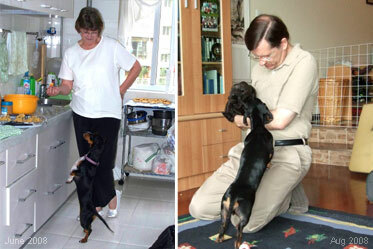 (April 2007) Here are two photos that show Gimli's size after she turned six months old (26 weeks). Believe me, it wasn't easy to get her to sit still like this when you want a photo or a measurement! Andrew was holding a dog biscuit in front of her. Over time, she learned (and now consistently obeys) the following commands (in the house--not outside; she has a mind of her own outside): sit, down, over (roll onto her side), penguin (stand on her back legs, which makes her look like a penguin! ), quiet (stop barking), and stay (for up to 30 seconds, with "hao ba" as the release word); she also seems to understands the following, though we don't use them often anymore: bie ba (don't do that with your paws), bie chi (don't eat that), time out, and go potty. Sometimes she responds correctly when we say "Go to mommy/daddy/Andrew."  If some of those commands look strange, note that some are English and some are Chinese. See her growth chart on page two. Notice that she seems to have stopped growing at around week 30. (Late April 2007) Either because Michael or Gimli had gotten smarter (we don't know which! ), Michael iwasn't getting as many scars as he used to. Gimli still loved rags and towels best, but sometimes retrieved (and almost voluntarily gave back) a squeaky ball or an empty cola bottle. The photos below (left to right) show that her favorite spot iwas still Andrew's lap; you can see how long she is when she stands up; "pining at the fence" (back then, her movements were restricted because she often wet the floor, and she hated to be alone); she also loves to sleep under someone else's blanket, either on the sofa or on Andrew's bed; after each outside adventure, she gets her feet washed--but since she doesn't like the water, we often just use a damp cloth to clean her paws. She keeps herself clean, so we don't often give her a bath, but she needs her claws clipped about once a month. This is not fun for any of us, so we prefer to pay one of the local pet stores to "bathe and clip" her once a month. Gimli's face and temperament bear a resemblance to beagles, but she apparently gets length and big paws from her basset or dachshund ancestors. Gimli relieves herself by standing on the plastic grate over our Chinese toilet. When she was small, she needed a step (which has long-since disappeared). The wire in the bottom right was in place when we left the house, to keep her in "her room" (without it, she jumped out). This photo (left) shows her "bedroom" (where she is when no one is home, along with part of Michael's office). 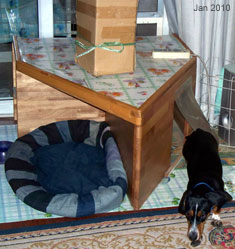 Her food and water are to the left (not in the photo), her crate is in the center, and her potty is on the right. This is also our laundry room. When she was young, we put a "gate" in the doorway when we were not home. We started with gates short enough for us to easily step over, but by week 30 she could jump over anything like that. She can also use her nose to open most hinged gates, so it is a lot less convenient to keep her contained and yet retain access to the laundry room and other places. When she jumped over a gate, she went to "time out" (five minutes in her crate); eventually, she stopped jumping out, and she learned that just because she CAN jump over the barriers, she isn't ALLOWED to do so. She seems pretty smart, but with time and consistency she understood her limits. Update (June '08): Having an indoor potty is great. When she does her thing, she comes out into the hall and does "the dance" (you know, the way a dog scratches/kicks with her hind legs after gaining relief) and then comes to Michael for a dog cookie. After "good girl!" someone (usually Andrew) flushes. 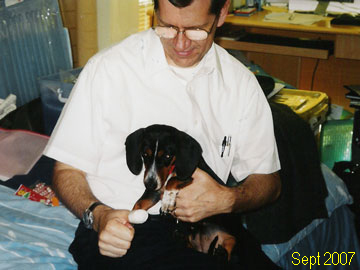 Other interesting notes (June '08): Gimli likes to lick (hands, toes, your face, or any other exposed skin); having a dog lick your toes or your ear tickles! When one of us comes home (this is still true in 2010), she races to the door, smells your shoes, and jumps up to lick a hand. Once she is satisfied, she goes back to whatever she was doing. By the way, you can't reach down to pet her until she has jumped up and licked you; if you try, she wets the floor. She goes crazy until she meets whoever new arrives in the house, but we can't let guests reach down to pet her (for at least fifteen minutes), because she will wet the floor. The books call this "submissive urination"; we call it a nuisance! She seems to prefer female guests to male guests--sometimes she barks at the man who delivers water bottles or Michael's male students! She is also generally afraid of any other dogs she meets outside, regardless of size (unfortunately, she has no "dog friends"). When she was little she loved to eat tissues and toilet paper (this isn't allowed, but she ate them when she could find them). She had even been known to steal a tissue from Michael's pocket while sitting next to him. Sometimes she gets a tissue or other paper out of Vivian's trash can (even in 2010), but she doesn't do this with any other trash cans in the house. There are times when she "goes crazy" and runs around the living room like a mad dog (bouncing on and off the sofa, going under it, and running like crazy); generally we think this is a sign that she hasn't had enough exercise lately! Favorite forms of indoor exercise include chasing a soft stuffed ball, playing with a towel or wash rag (with or without a person holding one end), and chasing tidbits (dog food, peanuts, or banana chips, normally). In the latter, we throw them in opposite directions and she tries to get them before they come to a stop. Gimli isn't allowed to loiter in the dining room, except on a specific rug (she is supposed to just "pass through", and if she stops we yell "you don't belong in here"--at which she scampers to another room or to her rug. Her rug has become her favorite spot during our dinner. When she was a puppy she never got "people food" so she amused herself elsewhere when we ate; after she was a year old we started to add a little "people food" to her dog food, and ever since then she has made that rug her perch while we eat. She particularly loves "rice with leftovers." 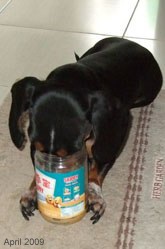 Ever since she was a puppy she has also loved peanut butter (see below). She also goes crazy when she hears the "peeler" because she loves to eat carrot shavings and the apple peal (as well as the seedless part of the apple core). Sept. 2007. Gimli is curious about anything new. Above, Michael cut his thumb badly, and had to go to see a doctor-friend to get the bleeding to stop. This was taken when he got home. Below left, Vivian is making cookies, and Gimli can almost stand tall enough to see what is happening on the counter. Below right, Michael is playing with a puppet that he uses to teach children (it looks like a beaver). Sept. 2007. Little rawhide bones, chew sticks and other treats disappear almost immediately. They say that beagles swallow first and taste things later, and this certainly applies to Gimli. So, we tried this big rawhide bone. She blissfully worked on it for up to half an hour at a time (when we took it away), and it lasted for many days. She also loves her Nylabone, which we also have to take away and hide after a 30-minute session. If she has the rawhide too long, she throws up; if we don't watch the Nylabone, she eats shards of the plastic (even though this is not supposed to be possible). 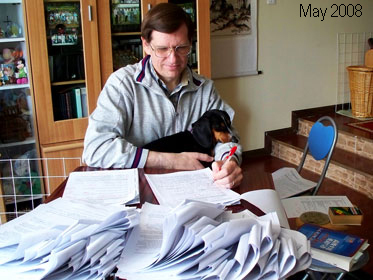 In May 2008, Vivian took this shot of Gimli "helping me" grade student exams. She has always hated to be alone, so she jumps onto a lap whenever she can. But it's hard to mark tests with a dog sleeping on your arm, so she had to find another lap once this photo was taken! Like children past that "cute" age, Gimli stopped being the center of photographic attention after she stopped being a puppy. That, and our general busy-ness, has keep me from adding much to this page lately, but we still love this little dog and we are really glad we brought her into our lives! (Right) Even Gimli participated in Star Wars Risk at Andrew's 2007 birthday party. You can see her in several photos on our Christmas pages, too. 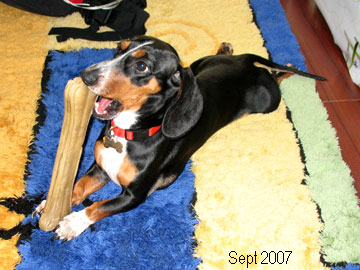 (Left) Gimli's paws don't give her much help in liberating the turkey from this Thanksgiving (2008) bone. (Below, left to right) (1) Gimli anxiously waits, hoping that Vivian or our housekeeper will drop some of the apple pieces that are being made into a pie for guests. (2) Once the peanut butter jar is empty, Gimli gets as much of the rest as her long tongue can reach. (3) During a break in "game time" with students, Gimli entertains (while Andrew looks on) by acting like a penguin in order to win a banana chip. (4) Michael created a wooden chamber and special dog-door panel to allow Gimli free access to the balcony (instead of cutting a hole in the sliding door). She loves to sit in the sunshine, and likes to look down on the neighbors. The top of the chamber was designed to support our Christmas tree in December, or a fan or clothes rack during the rest of the year. 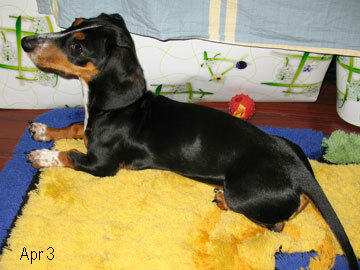 We said goodbye to our beloved pet when we moved away from Kunming in 2010. I've explained at the top of page 1. We miss her very much, but she has a nice home with a Chinese family (our neighbors), who say they love her: "Gimli makes us laugh and add happiness to our lives."